Coaching youth soccer can be so much fun if you have the 3 P's! Passion, Preperation and Progression. You already have the Passion for soccer because you've visited my site. Preperation and Progression are two things which my site can help you with. I have loads of drills and games which will help your preperation for practice's. Progression relates to how your practices progress and more importantly developing your young soccer players into little stars. I loved coaching youth soccer to the younger ones! They can bring so much energy and enthusiasm to practices. I created so many on the spot games when coaching these players depending on the attitude and excitement the players brought to practice. 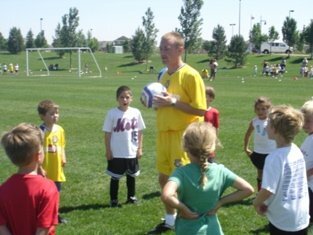 The picture below was of me coaching a U7 age group back in 2008. It is important that the young players see you as someone they can relax and have fun with. They also need to constantly be asked questions relating to soccer. For example, I would ask the young U4 age group "Which part of the body do we NOT use in soccer?" Before long all the players will respond with the correct answer (hands!) Get them to wave at you when they shout out 'hands' too! This will not only coach them the correct soccer rules but also make them feel clever when you congratulate them. I have divided each age group up starting with U4 - U5 and included the drills and games that relate to this age group. These can be seen on the left hand side.